The Japanese honey bee "Apis cerana japonica" is the wild bee species native to Japan. Before the Meiji restoration it was popularly kept in gardens for its honey but its numbers were dramatically reduced after the introduction of the western honey bee. However, recently the bee has seen a revival with the realization that the honey is well-suited to the Japanese body and has other unique properties. It has also become important from an environmental perspective to preserve the species. The Japanese Honey Bee Association was formed in June 1989 by people interested in protecting the environment, furthering research into the Japanese honey bee and protecting and increasing its habitat. Together with cooperation from researchers at Iwate University and other institutions the Japanese honey bees aerial copulation sites were established for the first time. July 1990 The cultivation of queen bees was first successfully achieved. The joint study group of the association and Iwate University published results in Science magazineﾕs Insectarium. April 1992 A patent was awarded for the construction of artificial bee nests using aerospace cellulose fibers. Kyodo News agency came to interview the association about bee aerial copulation. October 1993 The association was awarded the Japan Ministry of Agriculture Forestry and Fisheries prize at the TOYP, sponsored by the Japan Junior Chamber of Commerce. 1994 Studies were conducted to attract bees to certain breeding sites and to improve the construction of artificial nests for the breeding of queen bees. 1995 Studies were conducted to allow the symbiotic habitation of western and Japanese honey bees, to discover the feeding preferences of Japanese honey bees and the successful long-distance transportation of their nests. JAICA visitors from Paraguay came to observe the groupﾕs activities. In the Aska region near Morioka a meeting was held to discuss the promotion of the association and it was decided to build a honey bee village. April 2000 An easy-to-understand manual on breeding the Japanese honey bee was produced (Japanese only) entitled The Japanese Honey Bee. 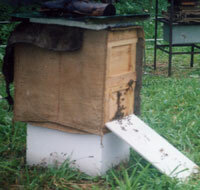 August 2000 In Aska near Morioka 30 beehives were established at the Japan Honey Bee Village. September 2000 Horse Chestnut and Tulip trees were planted at the Japan Honey Bee Village. Special ridges to protect from cold were constructed.